The Aboutaams, brothers Hicham and Ali, sell antiquities from various historical eras including the Hellenistic period which started in 323 (following Alexander the Greata? ?s death) and lasted until 31 BC (with the battle of Actium).A? During this period, culture became richer throughout the world and Greek mythology and thought were prominent through the Middle East and Mediterranean Sea.A?A? 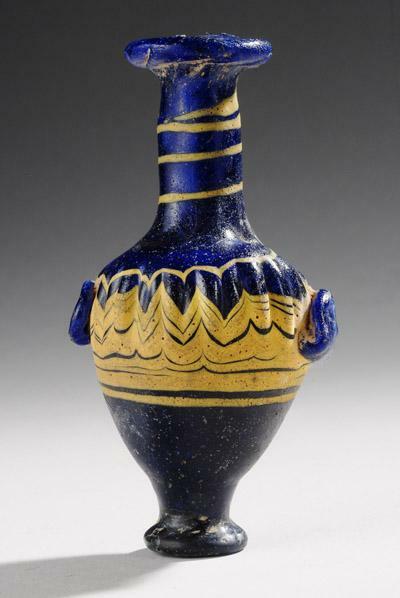 From the Hellenistic collection at Phoenix Ancient Art, Hicham Aboutaam sold a blue and yellow core formed glass Amphoriskos with a small flat base, long elegant neck, and tiny decorative horizontal handles. The glass is cobalt blue, with threads of yellow in feathered patterns ornamenting the body.A? These types of vessels were crafted by trailing decorative threads of molten glass over a core of sand, mud or clay, forming a vase.